Nadia then handed the show over to Michael from London BDS who had plenty of fire power and gave some examples of how their work is impacting on the Israeli regime, including one campaign that caused ‘Veolia’ (Israeli bin collecting company) to loose a billion pound council contract in the South of England. 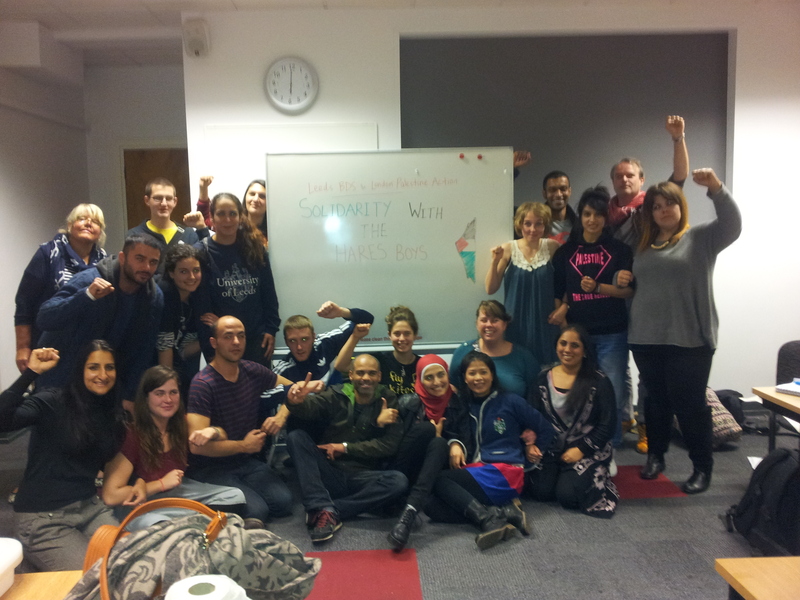 Following the War on Want workshop we were approached by a guy who asked ‘are you staying for the city of sanctuary workshop? 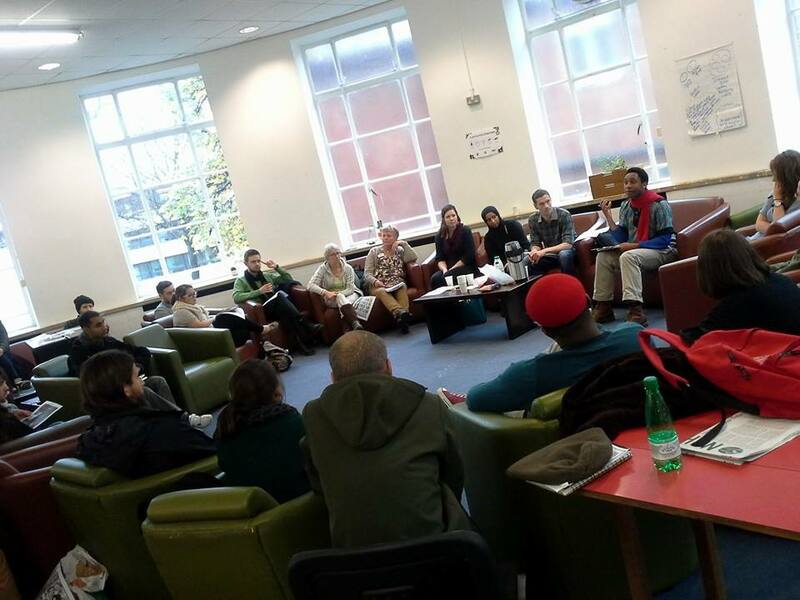 This was entitled: “Making Leeds welcoming and changing political discourse about asylum seeker refugees.” This workshop was run by a magical character called John Ojukwu Chijioke who has a real passion for life. John begun by sharing the idea of breaking ‘Kola’ which is a cultural expression in his home town that means to make a gesture of kindness, especially to the unacquainted. This might be something as simple as offering a ‘loveli’ cuppa tea. 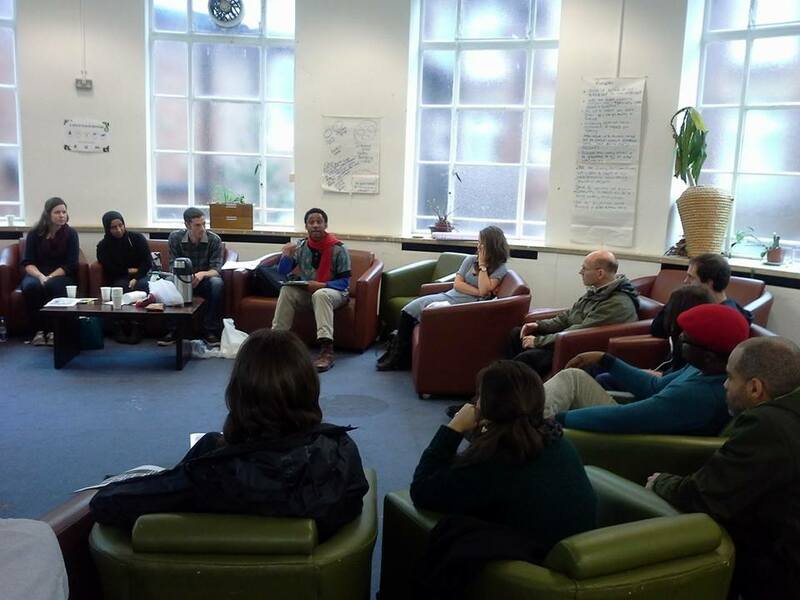 Braking Kola, and ‘making feel welcome’ is central to John’s cultural experience and he was really happy to share this and encourage others to help make Leeds more welcoming to all. It seems there is a positive psychic energy associated with making a stranger feel welcome. Likewise, the City of Sanctuary is all about creating a safer atmosphere in every city, especially to those fleeing persecution, seeking asylum and so forth. They are doing lots a great work and appear to have branches all over the UK, do check them out and support where ever possible. Then towards the end of the session, the same man who had asked whether we were staying gathered everyone in a circle holding hands while he recited the following poem ‘Black, White, Brown, Mixed… So What!‘, every time he said ‘Black, White, Brown, Mixed… the group was asked to shout ‘So What!‘ The people loved it. It turned out that this guy was a Poet by the name of Dumi Senda! Well it was impossible for us to ignore this talent who in turn presented us with a brand new copy of ‘When the Soul Awakens’, a wonderful book of 25 awakening poems. 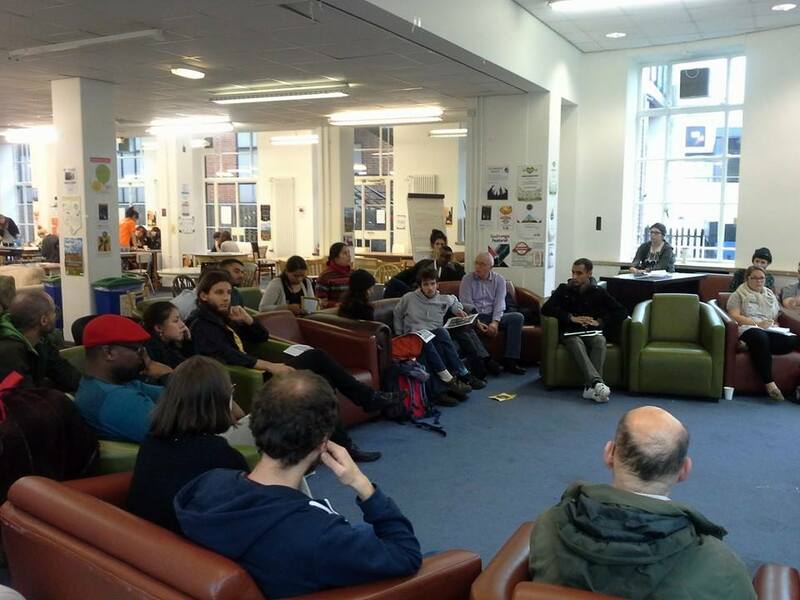 The following day on the 9th November 2014 London BDS were back on it, giving a direct action workshop at Leeds Uni. 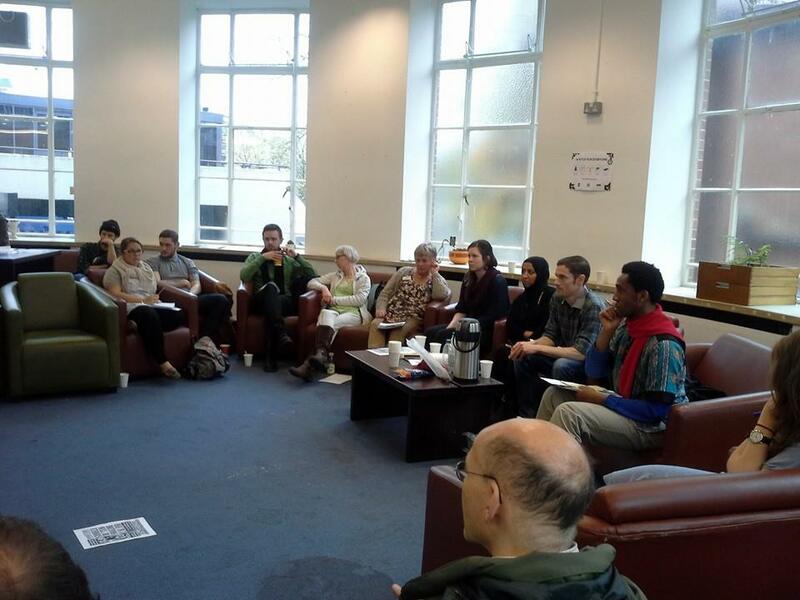 The room was filled with budding activists who obviously despise racism, islamaphobia and last but not least despise the destructive abuses of Capitalist Military Force. Direct action is a very important expression for the 21st century necessary for significant social change. Direct action may include a wide variety of creative and strategic actions, usually non-violent but yet controversial and usually geared towards illuminating an injustice, or effecting change, be it for the environment, vulnerable others or what ever so may be the case. Everyone was encouraged to bring a plate of food to share for lunch, many did, there was more chicken on the table than anything else. When it came to light there were vegans in the house, a veggie cried out’ but I love cheese‘. Well who would have thought, that anything contrary to a simple plant based diet itself renders its consumers complicit in the oppression of another ‘underclass’, the non-human animal different only by their appearance? How is it that we find it so difficult to make the connection between animal oppression and the oppression of those for whom we seek justice? And whatever the answer, does that make it okay… are we justified in our complicity? What are the implications of speciesism? Speciesism is a complex phenomenon, a prejudice that develops during childhood evolving from the accumulation of lies we are fed by the meat, dairy, egg and other animal exploitation industries. All too often this sadly results in a form of ignorance, a detachment from the animals who we enslave and consume, and a disconnection from our most innate human feelings of love and compassion. It tends to affect privileged members of society the most, to the extent animals are killed for fun in various blood sports. Nevertheless, it is a phenomenon that transcends gender, racial, cultural and socio-economic boundaries and manifests itself in multiple ways affecting our attitude untoward non-human animals and our understanding of their realities. Oppression affects all animals and not only human ones and in our complicity in their oppression we contravene the very principles that we seek to uphold. Through the oppression of one lie the oppression of all ‘Injustice anywhere, is a threat to justice everywhere’ ~MLK. Our friends in Palestine tell us plain, ‘we can still be for animal rights while fighting for human rights‘ ~Ahamd Safi, Ahmad’s message is simple, lets stop harming ourselves, stop harming animals, and stop arming Israel!